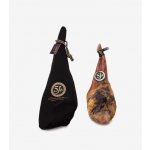 Acorn-fed 100% jamón ibérico, delivered from the centuries-old dehesas (meadows) of the Iberian Penninsula. 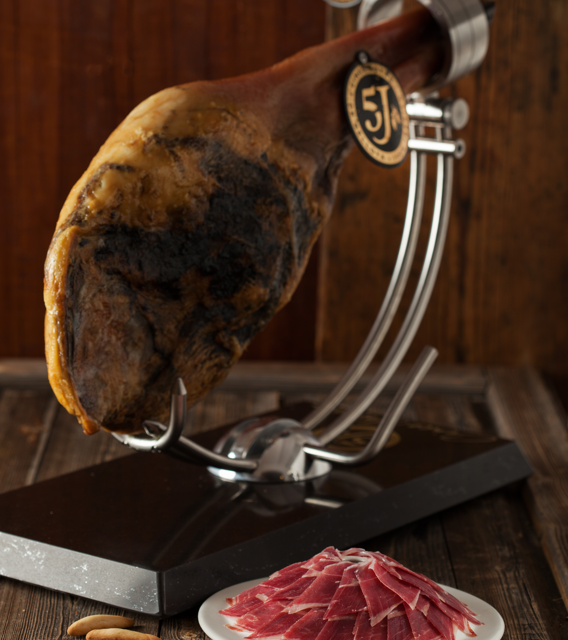 Cinco Jotas ham comes only from pure-bred ibérico pigs raised free range in the scenic dehesas of southwest Spain. It takes about two years for the 100% ibérico pig to reach maturity, and some more years are required to cure the jamón in the bodegas (curing cellars). This shoulder of the pig, sometimes referred to as "shoulder ham" and called paleta in Spanish, is a true Iberian delicacy. This delicious cut has plenty of meat and makes an ideal gift for "foodie" friends or simply to have at home for indulgent personal consumption. Acorn-fed iberico whole bone-in ham is a unique and healthy gourmet pleasure, a convenient way to savor the most exclusive and pure ham in the world. Perfect for a romantic dinner, socializing with friends, or any occasion where you want to stand out with a sophisticated indulgence. These whole bone-in hams are packed with unforgettable aromas, textures, and flavors of genuine pata negra ham, unveiling a multi-sensory culinary experience able to charm and delight even the most demanding of gourmet palates. The benefits of the healthy Mediterranean diet are well documented and enjoyed by health-conscious gourmands around the world. Acorn-fed 100% ibérico ham boasts many of the attributes of this nutritional way of life. The advantages of jamón de bellota include vitamin E (a powerful antioxidant), minerals such as copper (essential for bones and cartilage), calcium, iron, zinc, magnesium, and selenium. In fact, acorn-fed 100% ibérico ham is often considered to be amongst the most nourishing items in the esteemed Mediterranean diet. Store the ham in a cool, dry place to properly conserve and maintain freshness. Optimal serving temperature is between 64-72º F.
After trimming the ham (removing the fat), carve exceptionally thin slices to most authentically enjoy the enticing aroma and flavor of the jamón. Serve the paper-thin slices on a flat plate, with carvings from various parts of the ham to balance textures and flavors. The ham has a pleasant, long-lasting flavor, and a powerful, intense aroma, reminiscent of toasted nuts. 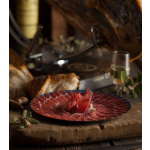 Savoring Iberian ham with your fingers is not only allowed but thoroughly encouraged. Buen apetito!. For your very first experience with Cinco Jotas acorn-fed 100% ibérico ham, try it on its own to savor the full experience and flavor. All Cinco Jotas products comply to the fullest extent with international and Spanish health certifications and regulations. 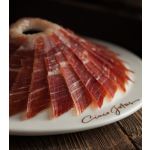 Created in 1870, Cinco Jotas has had four generations of experts who have contributed to the exclusive acorn-fed 100% ibérico pata negra ham. Since its founding in Jabugo the knowledge and wisdom from the locals provide the foundation for the craftsmanship that thrives in Cinco Jotas curing cellars, which has been a hallmark of the brand for generations.